Save a Book, Burn a Village! It’s Banned Book Week! As a person who abhors censorship and supports free thought and expression in all forms, Banned Book Week is one of my top favorite holidays. This is the time of year when we highlight those books that may terrify a small percentage of the population because of what they fear may happen if the information held within their pages is shared. The horror! Run for the hills! Grab your pitchforks and torches! We must destroy what we don’t understand! I obviously disagree. Knowledge isn’t inherently bad or good, it all depends on how you use it. I’ll be celebrating this fantabulous holiday in a few ways, first by listening to a free audio version of Kurt Vonnegut’s SLAUGHTERHOUSE FIVE, read by the author himself. I actually read it the first time when I was in high school. My dad had it lying around, probably found it falling out of an overstuffed bookcase, and the title or cover must’ve appealed to me. I don’t remember much except the last line of the book. If you’ve ever read it, I’m sure you know why. (I actually remember peeking ahead to see if it really ended like it said it did. I’m sure I’m not the only one.) I look forward to rediscovering this story, again. Listening to the tale in Vonnegut’s own voice will be an extra treat. Learn more about Kurt Vonnegut here. For the second way of celebrating, I turn to the American Library Association, who just released the yearly list of top ten frequently challenged books with the CAPTAIN UNDERPANTS (series) by Dav Pilkey in the number one spot. Reasons? Offensive language, unsuited for age group. Now, I’m pretty sure there are no curse words in CAPTAIN UNDERPANTS, so what could this offensive language be? And unsuited for age group? I can’t think of anyone that would be more suited to read a story about a superhero named Captain Underpants than kids. Who do they think would be more suitable? Adults? What are they talking about? Someone please explain this insanity. Meet George and Harold, a couple of wise guys. The only thing they enjoy more than playing practical jokes is creating their own comic books. Together they have created the greatest comic-book superhero in the history of their elementary school – CAPTAIN UNDERPANTS! But George and Harold’s principal, mean old Mr. Krupp, doesn’t like their pranks OR their comic books. He’s cooked up a plan to catch George and Harold and stop their shenanigans – once and for all! This book is about what happened when that plan backfired, and Captain Underpants leaped off the page to save the day! This book is based on a superhero that Dav Pilkey invented way back in 1973 when he was a second-grader. The comics that Dav made were very much like the comic book that George and Harold sell on the playground in Chapter 3. Many of the things in the book are taken directly from Dav’s childhood: the practical jokes, the comics, even the cheesy animation technique called “Flip-O-Rama” (Dav and his friends used to amuse themselves by making these flip-action animated pictures in elementary school). Dav Pilkey had dyslexia when he was a kid. He was always discouraged by wordy texts, small type, and lengthy chapters. Nope. Just not seeing anything diabolical mob violence-worthy there. Guess I will take a chance and actually READ THE BOOK before passing judgment. Yes, in solidarity of Mon Capitan el de Underpants, I shall read the first book of this series, and maybe even while in my underpants. Cape optional. Learn more about Dav Pilkey here. HAPPY BANNED BOOK WEEK, EVERYONE! What are you reading to celebrate? Last weekend there was a convergence of the sublime in Oklahoma City as the SCBWI Oklahoma chapter held its annual Spring conference. Great company, great speakers, great weather. Ah! I had so much fun and my brain was crammed with so many good ideas, it took me all week to process everything. And as two of my manuscripts were chosen for top speaker picks at the very beginning of the day, I did have to struggle at times to stay focused on being present, to listen and take notes, instead of sprinting down the revision tunnel express. First speaker of the day was the lovely Tricia Lawrence, an associate agent with the Erin Murphy Literary Agency. I do apologize for missing out on most of Tricia’s talk as my face-to-face critiques were scheduled during this time. I did get to speak with Tricia during the weekend and I gleaned information about her talk from those who were able to hear her talk. First of all, I loved Tricia right from the start as we both share Pacific Northwest roots. I spent some of my formative years in her neck of the woods and I still hold a special place in my heart for that part of the country. (A friend of mine swears this is why I don’t sound like I’m from around here, even though I’ve lived in Oklahoma almost without interruption since I was about four.) Tricia talked at length about how her career path was guided by the need to stay on the West Coast. She spent years working as a freelance editor among other things before breaking into the agenting side of the business. Lucky for us, her stars aligned at the right moment when she came to the Erin Murphy Literary Agency. During her talk, Tricia discussed how important it was to really get to know your characters before you start writing, to sit down and have therapy sessions with them. Put them on the couch and get them to spill their guts. She said they may not want to open up at first, they may much rather run outside and ride bikes or go play video games, so you have to keep digging. Ask them about their biggest fears, their most hidden secrets, what they want more than anything. Keep asking until they crack; until you know your characters inside and out. Hey, therapy isn’t easy, folks. It was a very stimulating talk that got several writers thinking of ideas all weekend. At least, I’ve never heard so many people eager to go into therapy. As a big proponent of self-exploration, I love this idea. I plan on putting my main character through some serious couch time starting this week. Tricia, like all of the speakers, mentioned some books that showed great examples of the ideas she wished to convey. All of the speakers mentioned how important reading was to the craft of being a writer. I know I say it all the time, but it never hurts to remind you guys that the professionals say it as well. You gotta READ!!! Visual story-telling using sequential images. It was such an enlightening talk and I must say, it made converts out of many of the participants. What struck me most was how many non-artists have written graphic novels: Shannon Hale, Neil Gaiman, Kate DiCamillo, Jane Yolen, Cecil Castellucci, Holly Black, and don’t forget Stan Lee, (totally not an artist!). Rainbow Rowell, author of ELEANOR & PARK, has a graphic novel series in the works with First Second Books right now. How exciting is that? Colleen discussed how you can add an extra layers of depth to your story with the visuals in graphic novels. Even by just manipulating the layout of the panels and how you use the spacing between the panels – the gutters – you can create completely different pacing styles to the story, similar to how traditional writers use sentence and paragraph structure. Fascinating. She suggested that if you were interested getting started in graphics novels, as a writer, you should read lots of plays and comics to help you get the flow of graphic novels. Script writing especially can aid in learning to think more visually about how you tell your story. Colleen gave us a comprehensive reading list hand out (another perk of coming to such a fabulous conference), broken down by age groups, so I won’t list all of her recommendations here. Some of them are pictured above. I will list others she mentioned by name. Learn more about Colleen here. You are most yourself around your family. Who else sees us at our most vulnerable? When we are exhausted, pushed to the limits, cramped in a minivan for hours on a road trip to Aunt Bonnies’s with nothing to do but listen to each other breathe and your brothers won’t stop farting or touching your side of the seat? Oh yeah. You really get to know a person in those circumstances. There are all kinds of families. You have to ask yourself what your character’s family history is before you begin your story. This is your character’s beginning, after all. No matter how much of this history you decide to show, YOU as the writer need to know it. Knowing whether or not your MC is friends with everyone in his family (or not) or whether your MC is supported or misunderstood at home will determine how s/he interacts with the world at large. It will also add more emotional depth to your story. Andrew showed examples from many different books to highlight the different ways that family dynamics can create amazing stories. Whether you use these dynamics to create empathy, as in THE HUNGER GAMES (whose heart didn’t break when Katniss volunteered to go into the death match in her sister’s place?) or to create conflict as in FANGIRL (what does it mean when your twin sister doesn’t want to be your roommate?) or to create a villain in the family as in THE GOLDEN COMPASS (Does Lyra’s mother love her or is she evil through and through?) bringing family dynamics into play can be the best thing for your character and your story. Can you believe how much sage wisdom was imparted in this morning session alone? It knocked my socks off. After an entertaining lunch where I hosted a table with Tricia Lawrence, who was ever so gracious with her precious time and insights. 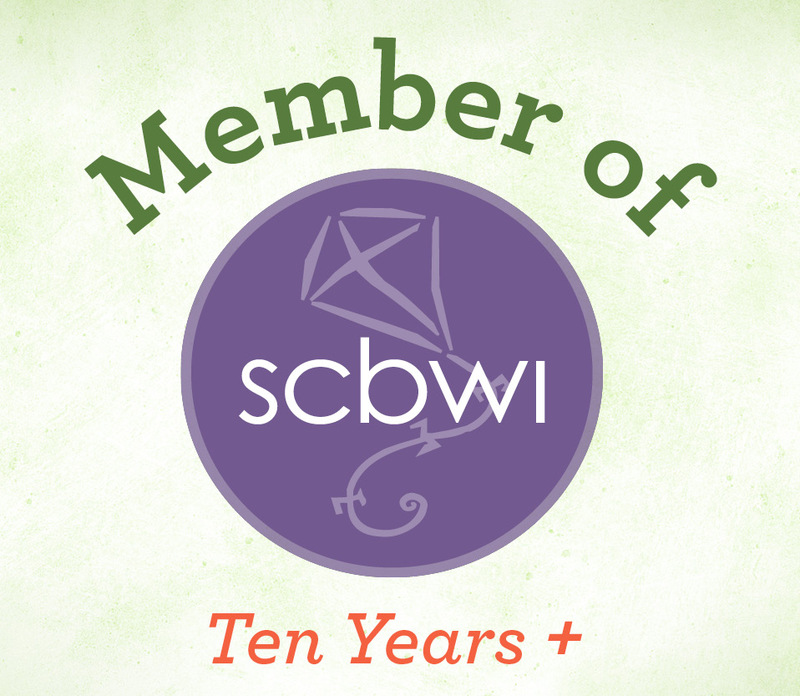 I met some new writers, one was attending her very first SCBWI conference and was so enthusiastic about everything, it was delightful to see. There were so many writers there with teaching backgrounds at my table; I may have been the only one without a teaching degree. After lunch, and a brief (and humorous) commercial for our Fall Retreat, we returned for our remaining three speakers.